Description This Duluth, Georgia hotel has an outdoor pool, free internet access, non-smoking guest rooms, an on-site restaurant and free breakfast. An outdoor pool and comfy accommodations are a few of the outstanding amenities offered at the Courtyard Atlanta Duluth/Gwinnett Place located in an upscale suburb. With 146 rooms on three floors this non-smoking property offers a setting that features attractive landscaping and a fenced outdoor pool. Indoor recreation options includes a health club with up-to-date equipment including workout machines with individual TV screens and mirrored walls. A 24-hour front desk service a barbecue and picnic area boarding pass print-out a business center a coin laundry and complimentary coffee in the lobby add to the package. Many of this Courtyard's attractively furnished rooms include 37-inch flat-panel HDTVs. There is an on-site cafe and parking is free. The hotel charges a security deposit upon check-in. The hotel is adjacent to Gwinnett Place Mall and close to I-85 and it's a short walk to several restaurants and bars. It's four miles to events at the Gwinnett Center and Arena. It's also 28 miles from Hartsfield-Jackson Atlanta International Airport 23 miles from downtown Atlanta and 15 miles from Stone Mountain Park. 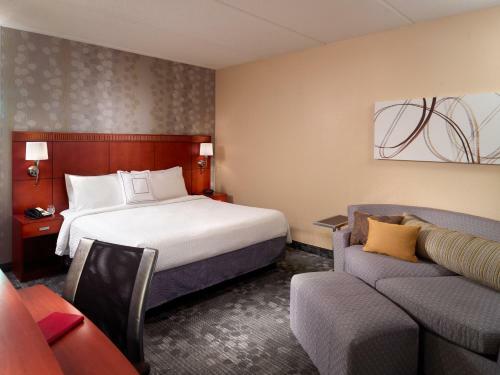 Add Courtyard Atlanta Duluth/gwinnett Place to your free online travel itinerary.